Val and Kar Rent a Car is a rental company that has a rich and long experience in the field. The car rental company offers new cars from different classes and sizes and you can travel without any restrictions in Bulgaria and Europe. You can rent a car from Val and Kar at all airports in the country and the neighboring countries, as well as from all major cities in Bulgaria upon prior request. We also deliver cars to your chosen location. 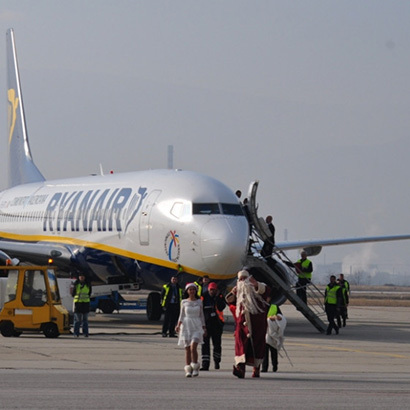 If you land or depart at Plovdiv Airport, you need to make a reservation at least 48 hours before your departure. So we will be able to meet you at Plovdiv Airport, prepare a car for you and prepare the necessary documents for your trip in advance. Please visit our site, browse the rental cars we offer and learn about the additional terms and conditions. Fill in all the details about your inquiry - date, time and place of pick up; date, time and place of return. You need to choose a car that's right for your trip. Take into account how many people will be and how much luggage there will be, compared to the size of the vehicle you intend to rent. Our smallest cars are also the cheapest. You have to decide if you prefer manual or automatic transmission for the car you will rent. When you browse our cars, apart from the basic characteristics, there are indicated the number of passengers and luggage that it can hold. Customers often choose a rental car at the lowest price and pay no attention to its size. If you are more passengers with more luggage or you choose to travel more families, you can take advantage of our offers for vans and minibuses to rent. In case you are traveling to countries other than Bulgaria you should click on "Travel Abroad" when filling in the online form and in a further comment to indicate the countries you will visit. With Val and Kar rental you can travel anywhere, but we need to know where in order to prepare the documents for that. In case you need any additional equipment, you have to pre-order it so that we will be able to supply it together with your car at Plovdiv Airport. If you need assistance in choosing a rental car or you want to ask us a question, you can do it through our online form, either by phone or via email. What happens after you finish renting a car from our car rental form? After you fill in all the details please confirm your inquiry. Once we receive it, we will give you a response about availability and what we still need as information. Filling in our online form is not a booking, and you can change the details before making the payment. When we specify everything necessary, you can choose how to pay the rental price and leave the deposit or liability. Car rental price can be paid with credit or debit card, online through our site, via bank transfer or in cash. When paying online or by credit or debit card, you do not have any extra fees for this. Deposit or liability can be left by credit card or in cash. After our confirmation of your reservation, we will welcome you at Plovdiv airport with a sign with your name. To do so, you must have sent us the flight number you are arriving with beforehand. Our fee to meet you or send you at Plovdiv airport is 15 €. The airport is located about 12 km southeast of Plovdiv, there are only several flights per week and the taxi transfer from Plovdiv to Plovdiv Airport will be more expensive, and only in case you find an available taxi. When you are in Plovdiv, you should not miss to visit the Аrchitectural and Historical Reserve "Ancient Plovdiv", located on 3 of the hills of Plovdiv called Nebet tepe, Dzhambaz tepe and Taksim tepe. With its cozy cobbled streets it is one of the main sights of Plovdiv, along with the remains of Roman times. Visit the Grand Basilica of Philippopolis, St. Ludwig Cathedral, St. Marina's Cathedral, the Art Gallery, the Ancient Theater, the Little Basilica, the Clock Tower, the cathedral Sveta Bogoroditza, the Roman stadium, the East Gate of Philippopolis, Konstantin and Elena church, Balabanov House, Ethnographic Museum, Red Pony Gallery, the Hill of Liberation Bunardzhik , Monument of Unification, the Archeological Museum, Belashtitsa Monastery St. Georgi Pobedonosets, the Aviation Museum, Kuklen Monastery St. St. Kozma and Damian, the Alpine shelter near the village of Hrabrino, Gornovodenski Monastery St. St. Kirik and Yulita, the Red Church - Perushtitsa, the Historical Museum - Assenovgrad, the Church of the Assumption of the Virgin Mary, the Paleontological Museum, Krichim Palace, Bryanovshtiza hut, the Historical Museum-Perushtitza, Assen's fortress, the church of Sveta Bogoroditza Petrichka - Assenovgrad, the Roman aqueduct, Yustina Fortress, Muldava Monastery, Ustinski Waterfall, Bachkovo Monastery, Belocherkovski Monastry St. Petar and Pavel, Bakurian Ossuary, Bachkovo Waterfall, Angel Voivoda Tower, Arapovo Monastery, Slivojolsko padalo Thracian Heron, Krichim Monastery Uspenie Bogorodichno, Roman Bridge - Chaya River, Red Wall Reserve, Ivanova Water Cave, Ahmetova Dupka Cave, Dobrostanski Cave pearl stone, Orehovski waterfalls, Bratsigovo History Museum, Cromleh in Cholakova Mound (Thracian Observatory), Holy Trinity Monastery and many other unforgettable places in the area.